My Love/Hate Relationship With My Natural Hair. Have you ever had those days where your hair is just not into you? Of course you have, We call that bad hair days. It’s like being in a relationship where you know the person is not right for you, but you can’t let go. Sometimes I feel good about having my natural hair. I feel free. I feel younger, but sometimes I wish I could part from it. I wish we could go our separate ways. I had a pretty bad hair week last week. It seemed like everything I tried just kept making my hair worse. I tried the NOTHING BUT products, my hair stayed the same. I did not notice any “enhancing” curls. I tried Giovanni Direct Leave-in Conditioner, my hair said, ” you tried that already.” I used a mixture of oils that had too much coconut oil in it, and my hair shrunk. I decided to get some cornrows and leave it alone. So I co-washed my hair today and saturated it with a mixture of Jamaican Black Castor Oil & and Extra Virgin Olive Oil. Oh! Free at last, free at last. Thank God Almighty, my hair is free at last. I pre-poo my hair with a mixture of avocado, honey, and extra virgin coconut oil before washing it. I wash my hair every Saturday with aphogee moisturizing shampoo, condition it with Tresemme Moisture Rich conditioner with vitamin E, deep condition it with Africa’s best hair mayonnaise, moisturize it with S-curl No Drip Activator Moisturizer, and seal it with extra virgin olive oil. I co-wash every Tuesday with Tresemme Moisture Rich Conditioner with Vitamin E. NO SHAMPOO, and follow the above steps. 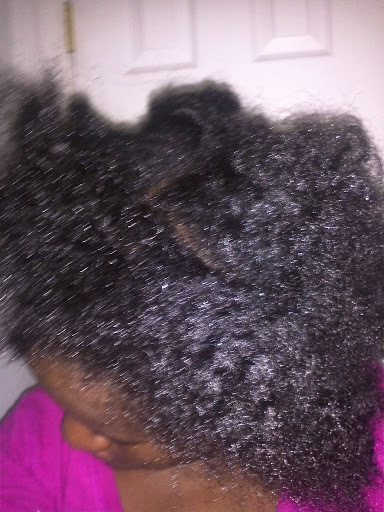 I moisturize and seal my hair everyday, sometimes twice a day with Scurl no drip activator/moisturizer. I love to seal my ends with my Shea butter mix. I air dry my hair after each wash, sometimes I dry it with a T-shirt first. I wrap my hair with a silk, or satin scarf, and I only use Silk pillow cases. I braid my hair to keep my ends protected.